The Best Options for Investing an HSA - Can I Retire Yet? The vast majority of people with Health Savings Accounts (HSA) use them as pass through accounts for the tax advantages they provide. Most people defer taxation on their earnings by contributing to the HSA, place the money in a savings account, and later take it out tax-free for qualified medical expenses. The standard use of an HSA misses an opportunity to invest these funds which can accumulate years or decades of tax-free growth. This sounds great but can be challenging. Because so few people invest their HSA accounts, this is a small niche market. The big brokerages don’t fight for a piece of this small pie. Many companies that offer HSAs have substandard investment options and high fees. This leaves few good options to invest an HSA. I recently opened an HSA and searched for the best place to invest my money. This is what I found. Best is a subjective word, and it depends on your individual needs. My objective is to provide a resource for those wanting to use an HSA as an investment vehicle. I spent hours researching this topic and narrowed choices to a couple great options. 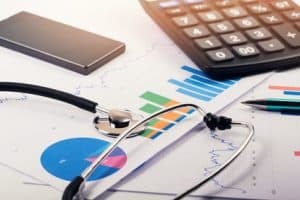 If you are not clear on the advantages of investing in an HSA, first read my earlier post on the topic and the robust conversation in the comments to determine if this is a good choice for you. There are articles reviewing a large selection of HSA providers. Some that I found particularly thorough are Morningstar’s “The Best HSA Investment Accounts”, Mom and Dad Money’s “How to Find the Best Health Savings Account”, and White Coat Investor’s “The Best Health Savings Account”. The above articles are provided as a resource for those of you who prefer to use your HSA in a more traditional manner, disagree with my criteria for defining the best HSA, or are looking for a more comprehensive review of HSA providers. I hate investing fees that eat away at returns, paying particular attention to avoid assets under management (AUM) fee structures. Understanding that investment companies need to make money, I favor companies that charge a flat fee. If it costs a fee of $50 to service an investment account of $6,900 (the 2018 HSA contribution limit for a family), this equates to an expense of .7% of investments. Assume investments and additional contributions grow to $100,000 over the next decade. It is no more work to service the larger account. The same $50/year flat fee would be only .05% on that sum. Contrast this with a company that charges .5% to manage your HSA, a common fee structure among HSA providers. It would cost $34.50 in the first year based on the same $6,900 balance, an initial savings of $15.50. However, on that same $100,000 investment down the road, the .5% management fee would equate to an annual fee of $500/year. When assessing investment options, pay attention to the impact of recurring fees that increase over time, as opposed to short-term savings of a few dollars. The goal is to grow investments. A flat fee structure, where fees don’t grow with investment balances, benefits investors over time. I eliminated providers which use an AUM structure, even if some were cheaper initially. This narrowed the list quickly. I hate nickel and dime fees to open, close, or transfer accounts, so I downgraded those with opaque or complicated fee structures. This further narrowed the list. I prefer a buy and hold, passive approach to investing. My rankings favor companies that provide access to low-cost index mutual funds or exchange traded funds (ETF) consistent with my investment objectives. If you have a more exotic or active investment approach, other providers may better serve your needs. Many HSA providers require you to keep a minimum balance in a savings account with low interest rates. This causes cash drag, which is essentially another expense. Assume you are required to keep $1,000 in a savings account paying only .5% or $5/year. If you can invest that $1000 at an average annual return of 6% it would generate $60/year, a difference of $55 annually. I favor HSA providers that allow first dollar investing. This avoids the drag of having money sitting in a savings account. As a do-it-yourself investor, I value a simple, easy to understand website. An easy to navigate investment platform is also important. A responsive team able to answer questions and help me navigate the investing process and accessing funds is a bonus. I pay particular attention to how I am treated prior to becoming a customer. If a company is not responsive when they are vying for my business, I have little confidence they will be responsive when I am a customer needing help. I plan to keep my HSA fully invested. Interest rates of savings accounts are irrelevant with this approach. If you prefer to keep some money in a savings account, then you can find superior interest rates elsewhere. Several HSA ratings compared the number and variety of investing options available. It’s challenging to build a substantial balance in an HSA. For most people, an HSA will be a small percentage of their overall portfolio and can be held in one or two funds. I didn’t give extra weight to companies that offered many investing options over those that offered a couple that fit my criteria of broad based, low-cost, passive index mutual funds or ETFs. My plan is to do one transaction/year in my HSA by contributing the maximum allowable amount as a lump sum. This approach makes trading fees and commissions of minimal concern. If you favor a more active investing approach or will dollar cost average contributions over the year, these fees may be of greater importance to you. Given those criteria, here are the best places to invest an HSA. I chose to open my HSA with Lively, a recent startup partnering with Choice Financial bank. Lively had several features that pushed them to the top of my list. Fees are extremely low, transparent, and prominently displayed on their website. Opening and holding the account is free. Investing costs $2.50/month ($30/year). Investing is done using TD Ameritrade. They offer low-cost commission-free ETF options. You may also elect to pay $6.95/trade to select from their full investment line-up. Lively’s customer service team was also far and away the most responsive and helpful of any company I researched. My primary concern with Lively is that they are a new, small, startup company. There is no guarantee their business model is viable in the long-term. Fees could increase or they could exit the market. Ultimately, I felt comfortable enough to give Lively my business. Even if Lively fails, my deposits pass through FDIC insured Choice Financial bank and my money is invested at TD Ameritrade. The HSA Authority is another excellent option for investing an HSA. They are operated by Old National Bank with investments through Devenir, a registered investment advisor. The base cost of having your account with The HSA Authority is only slightly more than Lively’s. An account costs $36/year and their fees and conditions are prominently displayed on their website. I liked several features of the HSA Authority better than Lively. The HSA Authority offers an assortment of low-cost Vanguard mutual funds among their investment options. For anyone who must have Vanguard funds or prefers index mutual funds to ETFs, this option is less expensive than Lively. The HSA Authority offers access to their investment platform once you have $1,000 to invest, and they do not require you to keep anything in a savings account once you begin investing. I ultimately favored Lively because they had superior customer service, but I don’t think you would go wrong selecting to invest your HSA with either of these providers. After sifting through HSA providers while researching this topic, I found Lively and The HSA Authority head and shoulders above everyone else for investing an HSA account. Although many companies offer HSA accounts, none offer the combination of low fees, passive index investing options, and first dollar investing like these two. Lively’s responsive customer service team pushed them to the top of the list and is why they earned my business. This topic isn’t talked about much. Thanks for writing it Chris! I may open an account to invest my HSA in index funds down the road because I want to be more passive with it long run. And I’ll look into your choices if I go that route. But I’ve had my own HSA account with a self-directed custodian who lets me invest in real estate related investments like property tax liens, private mortgages, and limited partnerships. Early on I had to partner up with the IRA and HSA of others to have enough to make a loan or invest in real estate. But property tax liens have also been interesting because you can often find them for smaller amounts, and you either get interest (3% per quarter in my state of South Carolina) or a deed to the property (at pennies on the dollar). Just thought I’d throw that out there as another possibility for those who like real estate or real estate related investments. I never thought about investing in RE in an HSA (or even knew it was an option). Thanks for sharing and expanding the conversation. Good article. I’ll have to dig further to figure out why HealthSavings Administrators didn’t make your list. FYI – My understanding is that sometime after the first of this year, the Federal government decided to change the 2018 HSA contribution limit from $6900 to $6850 based on using a different inflation index. I appreciate all Chris’s info, too, and spent some time reading the referenced articles. My personal choice is to remain with HealthSavings Administrators, despite of what Chris or his links report as about a $150/year in fees on a 60K balance. I don’t like their website, either, but I get near-immediate responses from them when I have questions, such as investment amounts. I like the choice of Vanguard funds, mostly in “Admiral” category. No transaction fees (but the .25% annual maintenance). I could trade free there if I wanted to, but don’t see a need to be active in an HSA. RetiredAt49. I started with Health Savings Administrators b/c they are the provider that Vanguard takes you to from their website. They have a base fee which is slightly higher than either of the two companies I recommended + a .25% AUM fee which will grow with your investments. They offer first dollar investing and a wide variety of Vanguard funds. Not the worst option in the world, but not the best either. Just trying to keep the article concise so people didn’t have to wade through all the options. Yes good catch on IRS rule change. I just got an e-mail from Lively announcing the decrease from $6,900 to $6,850. Thanks for sharing that. Agree that it is not a horrible option by any means and was the choice linked from Vanguards homepage that got me started on my search. Just hate the .25% AUM fee that will grow as a function of my growing balance. Otherwise, good investment options with first dollar investing allowed. I have HSAdmin. When I started, they had only one fee – about $39/year or thereabouts. Now, with the .25% AUM fee, I feel the pain of their fees. I will probably switch some time in the near future. Yeah, I hate anything AUM. So easy for fees to sneak up out of site, out of mind. My HSA is with Optum and, while not optimum (pun intended), it has low cost index etfs that allow me to be passively comfortable with my annual contribution investments. I would advise caution about investing in what we would consider alternative investments for this type of account, for anyone who thinks they may need to use their HSA to pay medical expenses. While that may be fine for a long-term IRA type of situation, if you are going to possibly need the funds for medical expenses, you’ll want to be fairly liquid in this account. Looking at my notes, I didn’t give Optum much consideration b/c they are not very transparent with fees and services. Also, there was one company discussed on Bogleheads that charges to reinvest dividends, and for some reason Optum jumps out in my head, but I don’t have it in my notes, so could be mistaken. Bottom line, just watch the fees. Generally if a company is not up front about fees, it is not by accident. Great suggestion to have a clear understanding of your investing goals and objectives with any investment that you may need to access in the short term. The one thing that bothers me is that neither Lively or HSA Authority currently integrate with Mint. I generally use Mint to track all transactions and assets. I’m aware of but have never used Mint. Remember that Lively and HSA Authority don’t actually hold your money. If you refer to the article, I noted the banks associated with each company for any cash savings and Lively allows you to invest with TD Ameritrade and HSA through Devenir. You may want to check if you can link those accounts. Did you look at Select Account investment options? They may be an OK company, but I’ve found that when there are many options and they are not transparent, it is not likely by accident and not likely to work in my favor. So they would not be my choice. Just my $.02 and hope that helps. I’ve been using Optum Bank’s HSA and it offers an array of good index and mutual funds from Vanguard, TRowe, BlackRock, Goldman..
See comment exchange above with Oldster. May be an OK option, but not very transparent and don’t allow first dollar so I didn’t give them much consideration. What are your thoughts on HSAbank.com? They are also using TD Ameritrade as the investment platform. It seems like hands off management. In fact, I don’t recall ever paying a fee unless there is a trade. They are another OK option. They are similar to Lively in using the TD Ameritrade platform, but have higher fees and require some money to be kept in savings. If you want to invest your HSA and are comfortable with TD, not sure why you would pay more for HSA Bank if you have the option to choose Lively. I guess the one positive in HSA Bank’s favor is that they’ve been around a while longer. We have Optum HSA, and no other choice due to company restrictions until we retire. Two questions: 1) will we be able to transfer these funds to another HSA once we retire? 2) I know you didn’t look closely at Optum because of they didnt allow first dollar investing, however, what do you think of the quality of the offerings within? 1.) Yes you can transfer. Unlike a 401(k), you may be able to do it without parting service, but you need to be careful in doing so not to not lose out on benefits like employer contributions or payroll deductions that eliminate FICA taxes, either of which can easily outweigh a relatively small difference in fees. 2.) I can’t recommend any specific funds, but in general yes they seem to have a great selection of Vanguard and Schwab funds. I’m curious if you evaluated Saturna? 100% can be invested, and since you trade once per year the fees would be $18,95 a year for something like VTI ($14.95 for the trade when you make your 1 time contribution, and $1 for each dividend reinvestment). Admittedly not a huge savings over lively, but if your preferred etf is not on TD’s commission free list it might make sense for those of us who trade once a year when we make our contribution. Seems like a great resource for those looking to place money in a savings account and looking for highest interest. In my research, the best options there are local banks and that seems to be a thorough overview. Thanks for sharing! Great article and the timing is perfect. I’m currently with HSA and am going to switch. I like Lively but I’m currently all in with Vanguard. I don’t have any ETF experience. Can anyone direct me to good articles about which TD ETF funds to lean towards? I’m 50 and using our HSA’s as an investment vehicle. I tend to follow the 50/50 stock/bond rule VTSAX and VBTLX. Thanks in advance for any/all help. We have to be careful to not cross the line to giving specific advice and recommending specific funds, but I included the link for the commission free ETF’s. You can click that link, click on the asset class you’re interested in and sort by expense to get a good start. Also, if simply more comfortable with Vanguard and prefer mutual funds over ETFs, HSA Authority may be the simple choice for essentially the same price. Hope that helps. Great article. At the beginning of this year I reviewed all of the options to transfer my HSA, and I decided to transfer it to the HSA Authority. My reasons were similar to those that you have noted – low fees (less than half of what I was previously paying) that are clearly identified, along many good mutual fund options to invest in through Devenir. It is nice to read that you rated HSA Authority so highly. Thanks for the feedback and glad to hear you’re happy with your choice.